Conan is always good for the occasional viral video. This week was no exception when the talk show host enlisted Nick Offerman, basically in his Ron Swanson character, to push a new product, handcrafted wood emojis. There is not much difference between Offerman and Swanson but we’ll take either one because they are equally laugh out loud worthy in whatever they do. Check out the clip for all of your wood emoji needs. The Parks and Recreation star, whose character has become a fan favorite waxes poetic about the benefits of purchasing his solid wood handcrafted emojis. The gifted comic actor opens the sketch with, “Hi I’m Nick Offerman, you might know me from the hit show Parks and Recreation. And your spouse knows me from his or her sexual fantasies.” Classic Swanson or should I say Offerman. Much like on the show, Offerman offers simple enough advice worthy of any do it yourself show on HGTV on how to craft your own solid wood emojis. 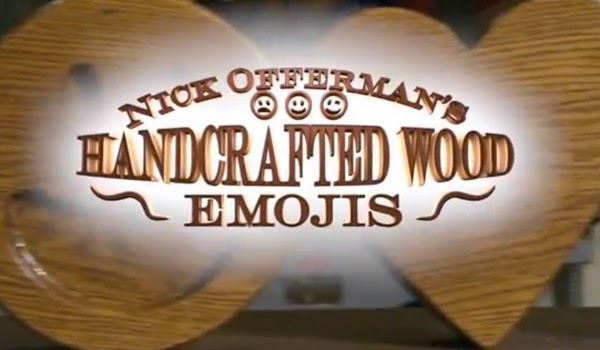 But this is an informercial, and Offerman is looking to make a sale so he goes into painstaking detail on just how the emojis are crafted and finished to suit your message needs. At just an average of 14 pounds per emoji, a lunch date is shown where the boyfriend brings five or so emojis to the restaurant table telling his girlfriend he is going to have to cancel their midday engagement. The king of blue collar workers and anti-government government worker strikes again and somehow by informercial’s end, you are ready to take out your credit card! And at just $29.99 apiece, somehow something crafted by Swanson/Offerman himself seems like a bargain. It appears that NBC is holding off the premiere of the final season (sad emoji) of Parks & Recreation until mideseason. With co-star Chris Pratt becoming an overnight movie star over the summer with Guardians of the Galaxy, it is no wonder that the brilliant sitcom is moving on after just seven seasons. Adding insult to injury for us die hard fans, the final season will be abbreviated with just a paltry 13 episodes. It always amazes me the shows that last over a decade and then their are the underrated shows that never quite caught fire in the ratings that end things too early. Frankly, the Park & Rec gang are just hitting their stride.